At present, copyright is ‘automatic’. From the moment an original work is created, the author enjoys all the benefits that copyright protection entails, without the need to complete a registration, deposit the work, mark it with a copyright notice, or comply with any other statutorily prescribed formality. However, the digital revolution has caused a paradigm shift in the way copyright-protected works are created and consumed. Copyright law is now facing significant challenges arising from the need to establish legal certainty over copyright claims, improve rights clearance, and enhance the free flow of information. Inevitably, proposals to introduce formalities in copyright law (or reintroduce them, as the absence of formalities has not always been the norm) have risen to prominence in legal debate. 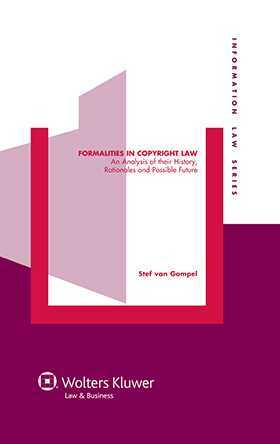 This book examines whether reintroducing copyright formalities is legally feasible. Based on a comprehensive and thorough analysis of copyright formalities, it sets out to establish the extent to which the current copyright system allows for their reintroduction. To this end, the author describes the role and functions of formalities, revisits the history of formalities at the national and international levels, examines the scope of the international prohibition on formalities, and scrutinizes the rationales behind this prohibition, including an in-depth examination of the validity of the argument that copyright is a ‘natural right’ and therefore should be protected independently of formalities. The author skilfully evaluates and contrasts the conflicting theories according to which formalities, on the one hand, add legal certainty to claims on the ownership of property, and, on the other, hamper individual authors from seeking adequate protection for their works. This book makes an important contribution to legal science by answering questions that so far have been neglected or only marginally addressed. To the degree that current copyright law permits reintroducing formalities, the author posits the specifications that will determine to a great extent what role and functions they may eventually fulfil: depending on the aims to be achieved, lawmakers must choose which types of formalities shall be imposed, and what their legal consequences shall be. This book goes a long way towards reinforcing the foundation for those decisions. Chapter 2. The Role and Functions of Formalities in Intellectual Property Law. Chapter 3. The History of Formalities in National Copyright Law. Chapter 4. The Prohibition on Formalities in International Copyright Law. Chapter 5. Contextualizing the International Prohibition on Copyright Formalities. Chapter 6. Relativizing the Legal-Theoretical Concerns with Copyright Formalities. Chapter 7. Summary and Conclusion.